“Murder at Broadcast Park” by Bill Evans is a new take on a murder mystery for me in that it takes place at a CBS TV station in the famous resort city of Santa Barbara. No station wants to be its own news during a time when ratings and beating the competition is foremost on their minds. John Rankin, a new employee assigned to the assignment desk, discovers news anchor Steve Johnson dead at his desk with a noose around his neck. What follows is the discovery of three more murders that have stumped the police and executives of the station. Evans does an outstanding job of describing the inner workings of behind the scenes at a television station, along with illicit affairs between interns and powers that be, including the station manager Lisa Campbell. The story is told from the third person, which sometimes got confusing as the scenes are short and often end abruptly. However, many facets keep with current events such as reporting news before one checks their facts. I found the characters to be quite interesting in that they all have their own agenda, which is to get ahead in the field. The dialogue sometimes felt slow as the author made his point previously and I didn’t feel the repetition was necessary. 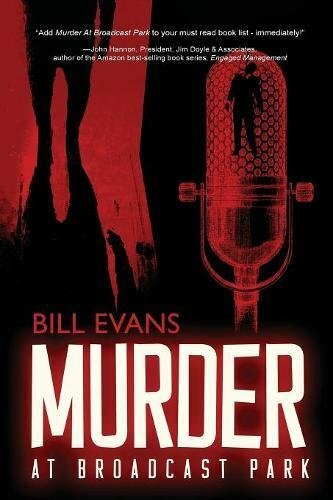 “Murder at Broadcast Park” by Bill Evans is a fast read that will keep the reader guessing as to who did it and why? It provides insight into staff meetings and human behavior - how individuals, regardless of a death of a famous staffer, vie to be the replacement. There are many twists and turns that will keep the reader engaged from the first page till the last. Evans knows the broadcasting field quite well and provides a unique twist to a mystery series. Readers who love a good murder mystery will find this story right up their alley.